Arrow sheds come in a variety of styles, designs and options. A floor frame kit, which is constructed of steel members to be used with sheets of plywood, is available, but building your own floor is an inexpensive alternative. Arrow recommends using exterior-grade plywood as the floor but not using any pressure-treated wood where the wood will come in contact with the metal of the building. The basic floor needs pressure-treated wood as a subframe but is covered by the exterior, untreated plywood. Protect your shed from the elements with various types of sealants. 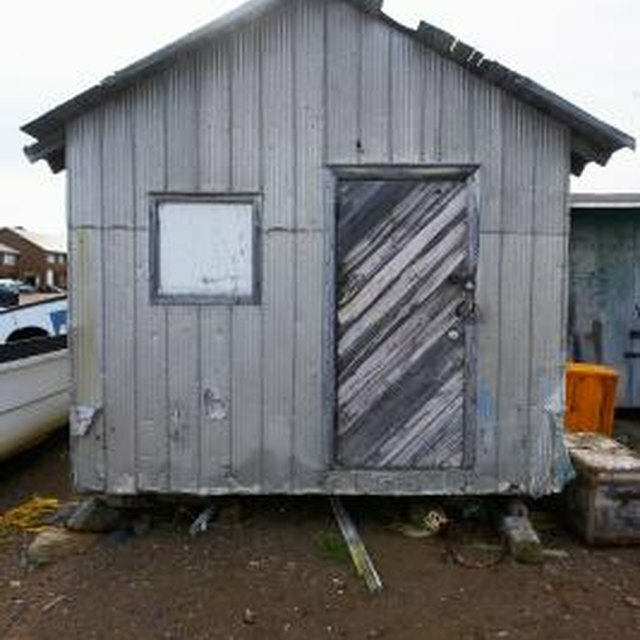 Measure the length and width of the shed along the lower edges of the shed. Cut two 2-inch-by-6-inch wood beams to the length measurement with a circular saw and two additional beams to the width measurement minus 3 inches. Assemble the four beams into a basic box shape with the ends of the width beams sitting against the inside edges of the length beams. All 6-inch sides must stand vertical. Drive two 3-inch, self-tapping, exterior-grade wood screws through the length beams into each end of the width beams with a drill and screwdriver drill bit creating a basic box. Measure and place vertical marks on the inside edge of each length beam every 16 inches from one end resulting in a pair of marks. The last pair may be closer than 16 inches to the end. Cut additional 2-inch-by-6-inch wood beams to the width measurement minus 3 inches. Attach the beams with wood screws to the box frame so that one beam is placed centered on each pair of marks creating the subframe for the floor. Attach plywood sheets to the top of the wood frame with 3-inch wood screws spaced every eight inches along the vertical and horizontal beams. Cut excess plywood off flush with the exterior edge of the frame using a circular saw. Attach the Arrow metal shed to the floor with 3-inch wood screws drilled through the base supports of the shed into the floor, or using an anchor kit available direct from Arrow.